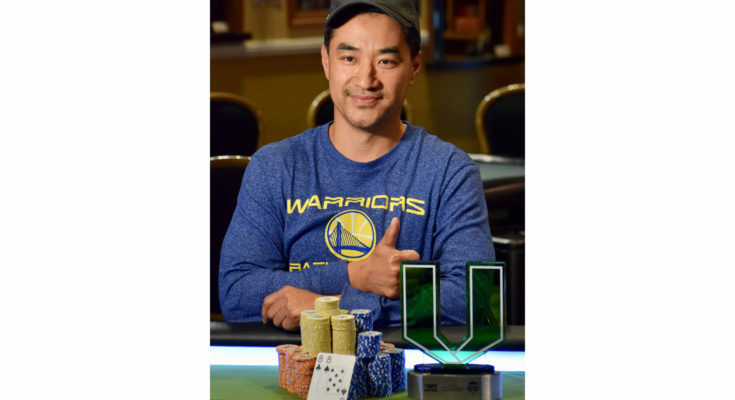 Rarely does one player so thoroughly dominate a four-figure buy-in poker tournament that he is given first place by the remaining final table players – but that was how Michael Lin ran over the WPTDeepStacks $1,100 Main Event field May 12-14 at Turlock Poker Room. The event drew a field of 181 entries for the two starting flights in Turlock, creating a prize pool in excess of $175,000 – easily surpassing the $100k guarantee offered for the tournament. Players like 2007 WSOP Main Event champ Jerry Yang, former WPTDS champs Darrel Dier, Jasthi Kumar and Sean Drake, former HPT champs Joe Nguyen and Allan Fernando, plus Tuan Mai, Randy Gil, Greg White, Kyle Kitagawa, Kathy Stahl and a large local player base turned out to join WPTDS Global Ambassador Tristan Wade in the event. More than 75 seats to the Main Event were won from satellites and daily tournaments starting as low as $20. There were 42 players who made it through the starting flights to come back on Sunday, May 14 to play for the title and an entry into the $1 Million Guarantee WPTDS Season Championships $2,500 buy-in hosted by Thunder Valley in December. Kitagawa dominated his Day 1 field and when Day 2 began he was 65 big blinds ahead of the second-biggest stack (owned by Wade), with Stahl not far behind. Lin was eighth of the 42 to start the day, and he began chipping up right away. Lin took over the chip lead not long after the redraw at 27 players, and was pulling away from the field once they reached the money at 21 players. When the final table began, Lin was well in front of the others – including Kitagawa, Wade, Stahl, Victor Paredes, Paul Saso, Travis Fujisaka, Mario Lopez, Loren Cloninger and Nathan Mirza. Once down to six players the field realized Lin had more than 60 percent of all the chips in play, and they came up with a deal that brought the tournament essentially to its end. Lin gave $3,000 from first place and retained the rest – including the entry into the $2,500 WPTDS Championships $1 Million Guarantee in December at Thunder Valley. The other five players took between $17,000 and $18,016 each. Play continued solely to dole out the WPTDS Player of the Year points, with no money factoring in the final few hands of play. Paredes earned the Player of the Series title with his finish, narrowly edging out Rick Peterson and David Champeny for the title, which was based on cashes in the six tournaments during the series. Peterson won the final prelim, a $225 buy-in with $50 bounties. Other tournament winners included Mai Xiong in the $225 series opener; Daniel West in Event 2 $125; Ray Miller in Event 3 $150 with $25 bounties, and a nine-way final table chop in the $125 Omaha 8-or-Better. This tournament series marked the last trip by WPTDeepstacks to Turlock Poker Room, a partnership that began before the World Poker Tour acquired the DeepStacks Poker Tour a few years ago. Turlock Poker Room, in fact, was the inaugural location for the WPTDeepStacks Poker Tour. The partnership did well for both groups, as the tour expanded throughout the U.S. and was eventually acquired by the World Poker Tour, while the poker room’s name and reputation grew among tournament and cash game players throughout central and northern California as a destination for competition, said Mario Alvarez, Director of Casino Relations for Turlock Poker Room. From the start of the partnership, the series drew players such as former World Series of Poker Main Event champ Tom McEvoy, WSOP Bracelet winners Wade, Michael Mizrachi and Mike Matusow and more. Wade – the WPTDS Global Ambassador who has come to Turlock to support the event for a number of years – placed seventh in this year’s main event.